When you talk about a startup, you likely envision bearded hipsters drinking fancy coffee at their expensive Macs. But not all startups are cut from the same cloth. Consider the following case. We recently met with a small team of talented long-time engineers in Madrid that is swimming against the tide. After working for many years in the electronics design industry, the engineers now innovating secure hardware products at a startup with big ideas and lofty goals. 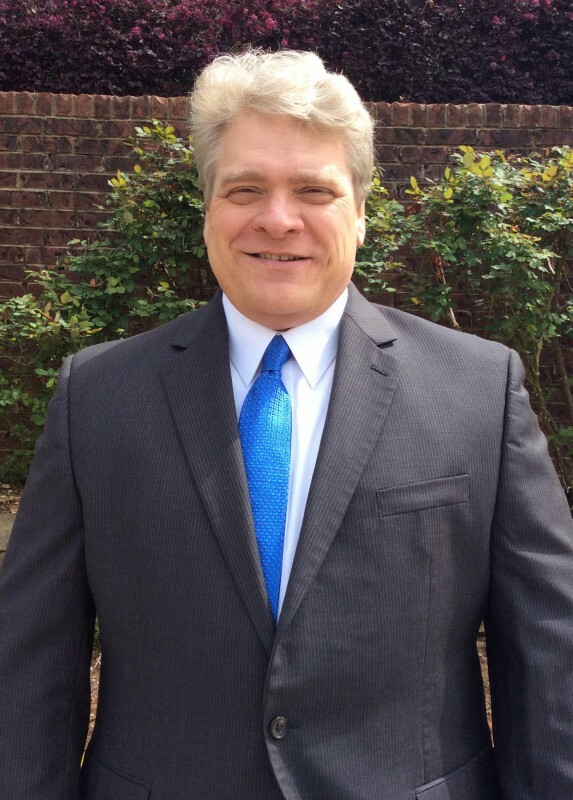 When it comes to embedded software, security matters. Programming Research Ltd (PRQA) helps its customers to develop high-quality embedded source code—software which is impervious to attack and executes as intended. 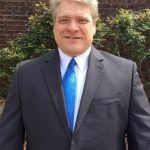 PRQA solutions are widely adopted by organizations whose products need to perform securely and reliably in mission-critical and safety-critical environments, as well as any other industry where software must behave as intended. 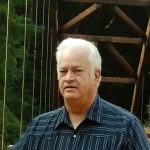 Click here to access the following whitepapers on embedded software security: Addressing Security Vulnerabilities at the Source; How IoT Is Making Security Imperative for All Embedded Software; Developing Secure Embedded Software: Quality Doesn’t Equal Security; and Addressing Security Vulnerabilities in Embedded Applications. 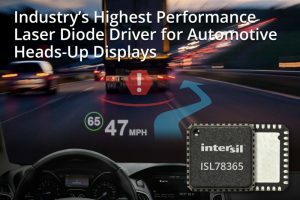 Intersil Corp. recently announced the ISL78365 laser diode driver for automotive heads-up display (HUD) systems. Capable of pulsing four high-intensity lasers up to 750 mA for projecting full-HD color video onto a windshield, the quad-channel ISL78365’s enables HUDs with high resolution, high color-depth, and high frame-rate projections. 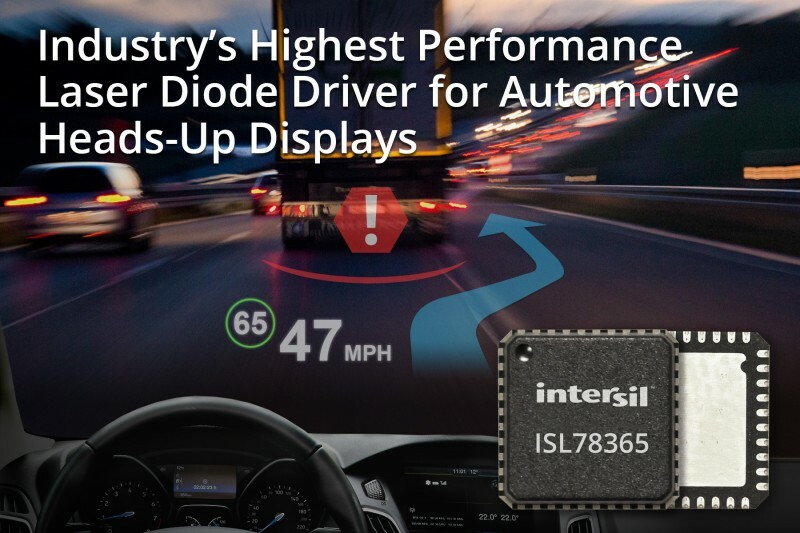 The only laser driver with a fourth channel for supporting a wide variety of laser diode configurations, the ISL78365 provides sub-1.5-ns rise and fall times. It also provides 10-bit color and 10-bit scale resolution to support a wide variety of contrast levels for each driver channel. Furthermore, it supports pixel rates up to 15 0 MHz or 1,900 pixels per line. You can combine the ISL78365 with the ISL78206 2.5-A synchronous buck regulator, ISL78201 2.5-A synchronous buck/boost regulator, ISL78233 3-A synchronous buck regulator, ISL78302 dual 302-mA LDO, and ISL29125 digital RGB color light sensor to provide a complete power supply system for automotive laser projection HUDs. The quad-channel ISL78365 laser diode driver is available in a 6 mm × 6 mm 40-lead WFQFN package. It costs $9.82 in 1,000-unit quantities. Antenova M2M is now shipping its first orders for the TransferJet coupler, Zoma (SR4T014). 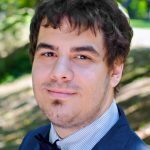 In addition, it is working with Icoteq to build TransferJet designs for customers worldwide. Intended to transfer multimedia data (e.g., photos to a TV screen), TransferJet is a close-proximity wireless transfer technology that radiates very low-power radio waves. It combines the speed of ultra-wide band networking with near-field communications (NFC) and operates over short ranges. TransferJet uses a coupler as opposed to an antenna. Antenova is working with Icoteq, which developed a sensor board for high-speed data upload using TransferJet. The 50 mm × 40 mm board feature an Atmel SAMS70/SAMV70 microprocessor and Antenova’s TransferJet coupler. 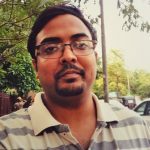 Sensors are at the heart of many of the most innovative and game-changing Internet of Things (IoT) applications. We asked five engineers to share their thoughts on the future of sensor technology. 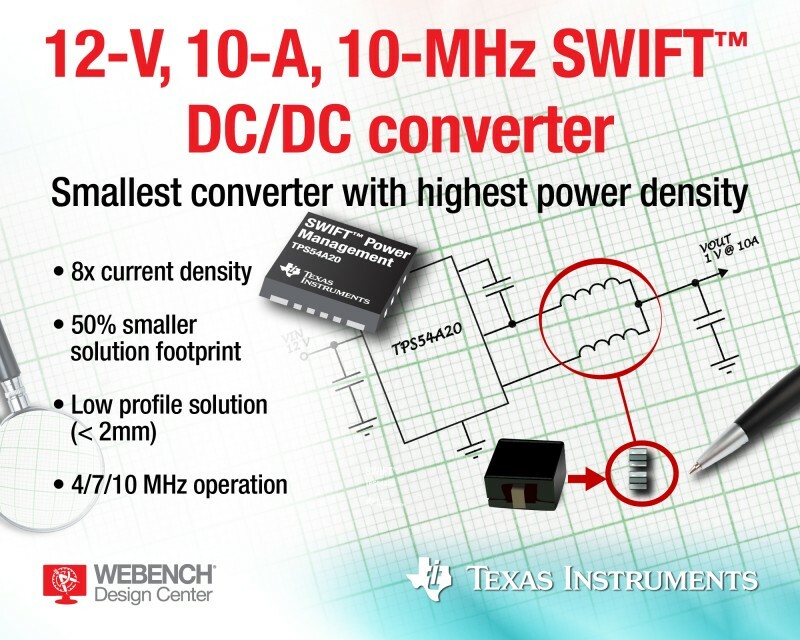 Texas Instruments (TI) recently introduced the industry’s first 12-V, 10-A, 10-MHz series-capacitor buck converter that achieves more than 50 A/cm3 in current density, which is 4× higher than any other 12-V power management component or solution on the market. The TPS54A20 SWIFT synchronous DC/DC converter’s topology enables high-frequency operation at up to 5 MHz per phase without special magnetics or compound semiconductors, which you can use for 8-to-14-V input and 10-A output applications. By using the step-down converter together with TI’s WEBENCH Power Design tool, you can get your space- and height-constrained point-of-load (POL) telecom and networking power-supply designs to market faster. Inexpensive, tiny 2- to 5-MHz inductors enable a 131-mm2 solution size that consumes 50% less area than similar 500-kHz DC/DC converter designs. A 14-ns minimum on-time allows for 4-/7-/10-MHz operation without compromising efficiency or EMI performance. The new DC/DC converter is available in volume. The TPS54A20 costs $3.25 in 1,000-unit quantities. Order the 4-MHz, 10-ATPS54A20EVM-770 synchronous dual-phase converter evaluation module and download the PSpice transient models. 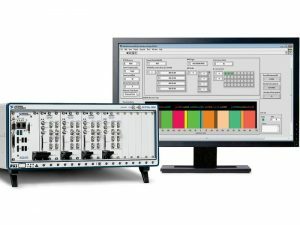 National Instruments (NI) recently announced an early access version of the WLAN Measurement Suite with support for the IEEE 802.11ax (draft 0.1) high-efficiency wireless draft standard. 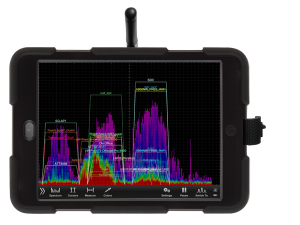 Combined with NI’s RF vector signal transceiver (VST), the WLAN Measurement Suite enables you to measure the performance of their 802.11ax designs confidently in the presence of significant new changes to the 802.11 physical layer specification. Aso called High-Efficiency Wireless (HEW), the 802.11ax is intended to improve the average throughput per user by a factor of at least 4× in dense user environments. This new standard focuses on implementing mechanisms to serve more users a consistent and reliable stream of data (average throughput) in the presence of many other users. 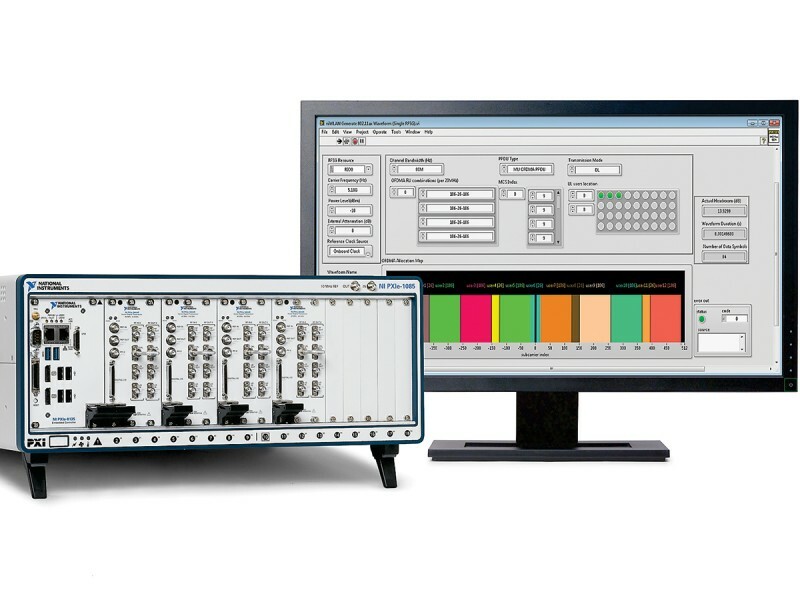 The WLAN Measurement Suite offers the power and flexibility to generate and analyze a wide range of 802.11 waveforms, such as 802.11a/b/g/n/j/p/ac/ah/af. Now, with the measurement suite’s latest update targeting 802.11ax, you can speed up development work on 802.11ax devices. The software supports key features of 802.11ax, including narrower subcarrier spacing, 1024-QAM, and multi-user orthogonal frequency division multiple access (OFDMA). The updated measurement suite also includes LabVIEW system design software example code to help engineers automate WLAN measurements quickly and easily. NI’s platform-based approach helps ensure you can update their existing PXI RF test systems to support 802.11ax device testing with a simple software update and continue to do so as the 802.11ax standardization process evolves. 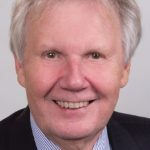 You can take advantage of this smarter approach to RF test to help lower the cost of testing and better prepare for future connectivity and cellular standardization initiatives, such as 5G. 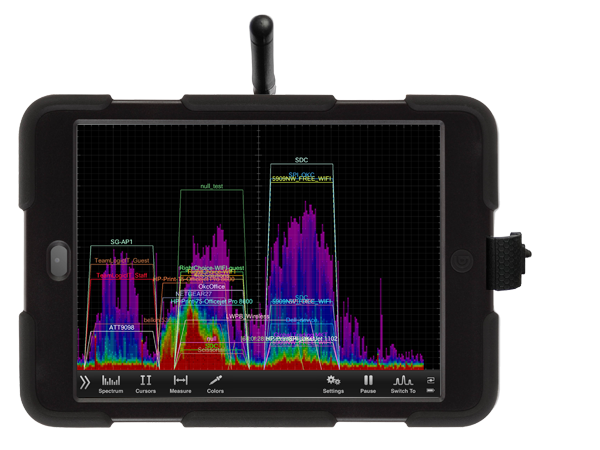 Oscium recently announced the WiPry 5x, a dual-band spectrum analyzer solution that visualizes all spectral activity on 2.4 and 5 GHz on both iOS and Android devices. A hardware plug-in accessory, the WiPry 5x makes possible to identify and avoid interferences and optimize wireless connectivity from a smartphone or tablet. The portable WiPry 5x is an excellent tool for field technicians, wireless professionals, and home audio enthusiasts who need to set up wireless audio networks. Oscium currently offers the LogiScope (logic analyzer), iMSO-204L and iMSO-104 (mixed-signal oscilloscopes), WiPry-Pro Combo (combination spectrum analyzer and dynamic power meter), WiPry-Pro (2.4-GHz spectrum analyzer), and now the new WiPry 5x Dual Band Spectrum Analyzer (2.4 and 5 GHz) with cross platform support. By adding coverage to the Android market and supporting 5 GHz, Oscium has expanded its customer base and made some significant improvements in direct response to market’s demands. The WiPry 5x visualizes all wireless activity on both the 2.4 and 5 GHz hands. Measurement settings include 802.11b, 802.11g, 802.11n, 802.11ac, and 802.15.4 (ZigBee). Also available is SSID-specific activity, which is ideal for troubleshooting home security, home automation, and home audio wireless installations. The WiPry 5x costs approximately $499. WiPry software is free both in the Apple App Store and on Google Play. Although initial support will only include iOS version 7.0 or higher and Android version 4.0.3 and higher, the hardware can support other platforms such as Windows, Mac, and Linux. Compatible devices include Apple’s iPod touch (5th generation), iPhone 5 to 6S Plus models, and all iPads from the third generation forward, including the iPad Pro. All Android devices with USB On-The-Go are compatible. 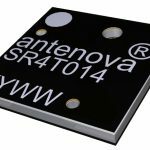 Antenova recently announced three new flexible printed circuit antennas—Mitis (SRFL026), Moseni (SRFL029), and Zhengi (SRFC015)—to cover the 3G, 4G, and LTE bands. 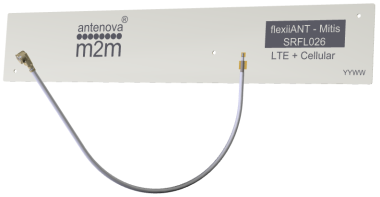 The flexible antennas—which belong to Antenova’s flexiiANT range of antennas—offer options for all of the world’s 4G and LTE bands. You also have a choice of antenna shape and size. You can fold the flexible FPC antennas to fit inside small electronic devices. You can position them vertically, horizontally, or co-planar to the PCB. and are ideal for use in applications where there may not be room for an SMD antenna. The Mitis and Moseni antennas were developed for 4G and LTE applications, including MIMO. The Zhengi covers all of the 3G and 4G LTE bands B7 (2,500–2,690 MHz) and B30, B40 (2,300–2,400 GHz), including LTE Bands B7, B30, B38, B40, and B41. The antennas come with an IPEX MHF (UFL) cable in a choice of three lengths for easy connection to a wireless module, making them effectively plug-and-play antennas, particularly as they can be integrated without matching. Each one has a peel-back self-adhesive backing that enables you to position it in a variety of designs. The Mitis, Moseni and Zhengi antennas are designed for a wide variety of applications, such as smart meters, remote monitoring, M2M, and IoT devices. Nordic Semiconductor recently announced that Arduino’s new Arduino Primo features its nRF52832 Bluetooth low energy SoC. 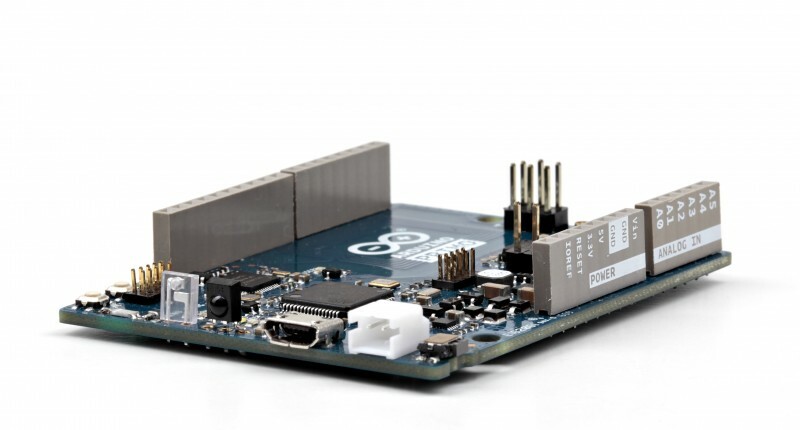 The IoT-targeted Arduino Primo PCB features native Bluetooth low energy wireless connectivity and includes Near Field Communication (NFC), Wi-Fi, and infrared (IR) technologies. In addition to being able to wirelessly connect to a wide array of Bluetooth low energy sensors, the Arduino Primo uses the nRF52832 SoC’s integrated NFC for secure authentication and Touch-to-Pair (a simple BLE pairing function requiring no user interaction), and has embedded IR for traditional remote control. 512-KB flash memory and 64-KB RAM, and a fully-automatic power management system to optimize power consumption. You can program via the Arduino Integrated Development Environment (IDE) programming interface. If you want to access the Arduino Prio’s most advanced features and functionality, you can use any Nordic nRF52 Series-compatible Software Development Kit (SDK) or programming tools. For example, the nRF5 SDK for IoT enables you to develop IPv6 over Bluetooth low energy applications on the nRF52832 SoC. 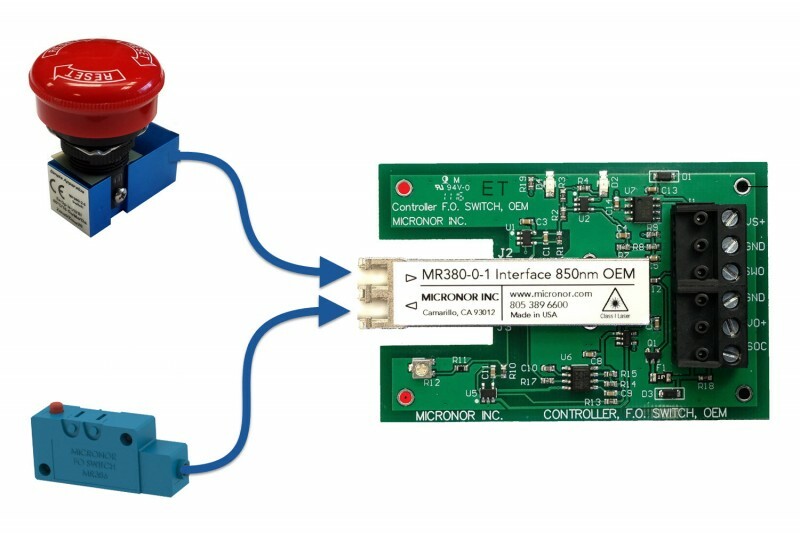 STMicroelectronics will run 1-hour webinar on May 19 for designers interested in optimizing stepper motor control designs. You’ll receive an overview of STMicro’s Integrated Driver ICs for stepper motors with specific focus on the digital motion engine approach, an innovative architecture to ease the design and control of motors with high-level SPI commands. You will learn how the digital motion engine core enables users to select motion profiles with acceleration, deceleration, speed, or target position via an SPI and a dedicated register set. You’ll also learn how to distinguish between various stepper motor driver product features along with their advantages/disadvantages. Experts will also provide tips for testing and improving various system-level characteristics. Texas Instruments recently introduced two 65-V, 150-mA synchronous DC/DC buck converters for powering factory automation and automotive sensor applications. 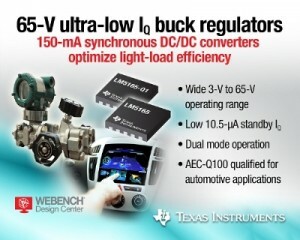 Featuring 10.5-µA quiescent current (IQ), the converters are intended for applications requiring high efficiency. The LM5165 (industrial-grade) and LM5165-Q1 (automotive-grade) micro-power step-down regulators feature a wide input voltage (VIN) range and dual control modes for optimizing efficiency and PCB area. Low 10.5-uA standby IQ (operating with no load) enables 90% conversion efficiency at 1-to-10-mA loads to extend battery life in “always on” applications. 100% duty cycle enables low-dropout operation, while a P-channel high-side MOSFET eliminates the bootstrap diode and capacitor. Dual-mode operation: a pulse frequency modulation (PFM) control mode enables the highest efficiency power supply design, while a constant on-time (COT) control mode provides higher output current and better EMI performance. Fixed 3.3- and 5-V options eliminate external feedback resistor dividers to lower BOM. Programmable current limit optimizes inductor size and cost. The industrial-grade LM5165 costs $1.35 in 1,000-unit quantities. The automotive-grade LM5165-Q1 costs $1.58.